Retirement adviser Ed Slott, interviewed by Lewis Braham, “Watch Out, Boomers, Here Comes 70,” Bloomberg BusinessWeek, March 24, 2016. About 75 million baby boomers began turning 70 this year, reports Braham. That means they’re near the point when the U.S. government makes them take their first required minimum distribution (RMD) from their IRA and retirement accounts. That’s their way of starting to collect taxes on the money you’ve been socking away tax-free for years and years. Do it wrong and you could pay a 50% tax penalty. Still, that’s no reason to stress. We help newly-retired clients set up customized retirement income flows that cover the monthly bills, meet the RMD requirements, and best of all, don’t break the bank. So if you’re one of those baby boomers pushing 70, don’t worry. You’re not getting older. 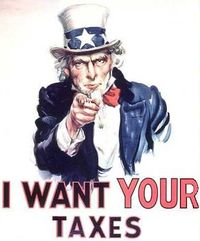 You’re getting closer to becoming a much more valuable source of government revenue!